I Can't Believe It's Not Butter! : How 'Bout These Ones? I know I said it yesterday.. but man he was tiny. Its kind of a silly to say considering he was 3lbs but I have to say it. I will never forget the first time I held him.. I wanted to but I was so scared. There was nothing to him. Then you asked me to walk him to the scale I thought I was gonna drop him. But thank God I didnt! Look how far he has come! He sure is a fighter.. I believe you had something to do with it?? you hung on for 9 weeks on bedrest.. so proud of you!! Not sure if I ever had said that to you.. so I am saying it now. You amaze me!! Ok.. didnt really intend on getting all sappy but looking at those pictures and looking at Jake now.. how cant I?? I've come over here from Jenn's blog, via Chris' blog .... lol. I just wanted to say your pictures are beautiful. 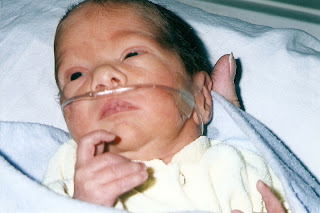 My first born was 8 weeks premature and was 2lbs 13 oz. I look at her now and I cannot believe she is the same tiny baby I held in my arms 5 years ago! 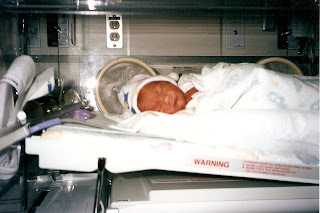 I even have trouble remembering what it was like holding a 3 lb baby. Hi Jamie! Thank you for checking out my blog and for the nice things you said about Jake. It is so amazing that a person can actually be that small, isn't it? 2lbs 13 oz!! Wow...I thought 3 lbs 16 oz was tiny. Holding something that small for the first time...do you remember that? What a feeling. 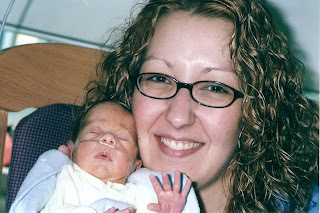 I remember being petrified, excited, worried, all the emotions a mother usually feels, but on a very different level. I still have all the leads that were attached to him for the heart and oxygen monitors, and every now and then I'll look at them and it takes me right back to those days. But like you put it...it's so hard to believe so many years have already gone by, and the 4 and 5 year olds we now have were once so very vulnerable and fragile.